Size: 5.6" x 3.1" x 0.45"
This Canon F-720 added a two-line display with formula entry to the functions known from its predecessor F-700. Dismantling this powerful calculator is somewhat disappointing. There is no hint to the true manufacturer of this OEM-calculator. 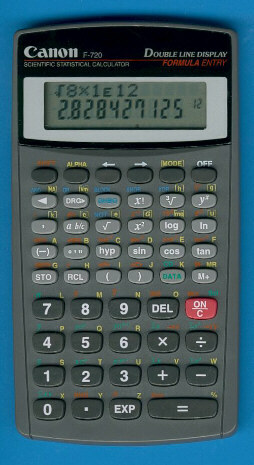 Running Mike Sebastian's "Calculator forensics" reveals the Canon F-720 as one of the "new-generation" calculators using binary arithmetic instead of the common BCD (Binary Coded Decimal) arithmetic to perform internal calculations. According to the manual this calculator uses up to 24 digits of precision and we get indeed the unbelievable result of 9.00000000005281641187... running the forensics test. © Joerg Woerner, September 20, 2003. No reprints without written permission.